Unisex reversible scarf. 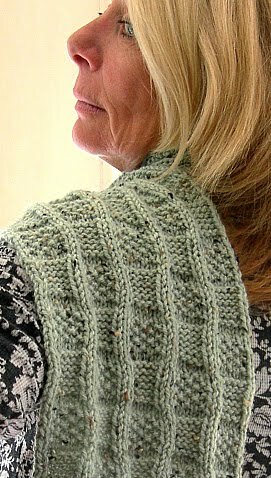 The pattern is very easy to memorize and it creates a textured lovely fabric. The scarf is reversible. İt only use 2 skeins of worsted weight yarn. To better show the textured fabric for this project İ recommend solid colors. The stitch pattern is suitable for scarves for man, woman, and even children. Gauge: 17 sts x 20 rows = 4 ” in St st with US 8 (5 mm) needle. Written instructions include a chart of stitch pattern too. The scarf in the picture is test knitted by Paula Muehlhauser. The model is Michele Moyer. 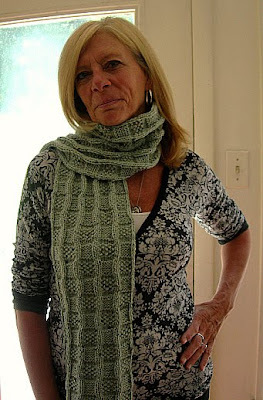 USD 4.95 (you will buy the written instructions for the knitting pattern, NOT the scarf). This scarf is rather long. But both popular design and color fit middle-aged people very much.